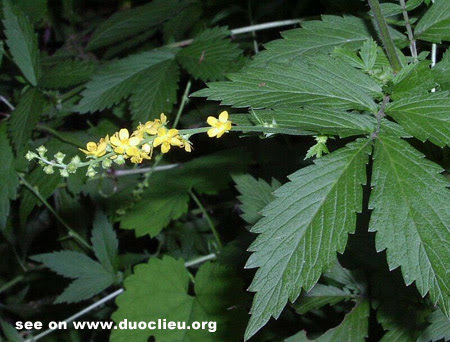 Botanical Name: Agrimonia pilosa Ledeb. Source of Earliest Record: Zhonghua Yixue Zazhi. Part Used & Method for Pharmaceutical Preparations: The buds are gathered in late winter or early spring. After removing the brown down of the bud, the buds are dried in the sun and, finally, pounded into powder. Meridians: Liver, small and large intestines. Functions: 1. To kill parasites; 2. To purge stool. Indications & Contraindications: Tapeworm. Agrimonia bud (Hecaoya) is taken with warm boiled water in the morning before breakfast. The tapeworm should be discharged within five to six hours.